Do You Think PAs Need More Visibility to the Public? Congratulations to the 2016 CAQ Recipients! The NCCPA website – already a hub for PAs seeking and maintaining certification and for employers verifying PA certification – now connects PAs and employers in a new way. The new PA-C Career Center just launched at www.nccpa.net provides access to PA-specific job openings in specialties, settings and locations throughout the U.S. Powered by Health eCareers, the PA-C Career Center already includes hundreds of PA job postings. From this single access point, PAs can also upload a résumé and sign up for job alerts to find out about new opportunities as they become available. Access to the PA-C Career Center is free to all PAs. NCCPA proceeds from job postings this year will be used to expand an endowed NCCPA scholarship administered by the PA Foundation. 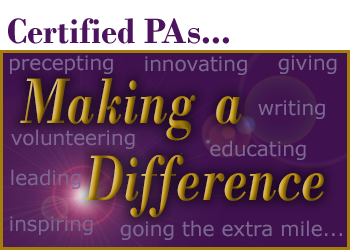 Last year we asked you to nominate Certified PAs who are making a difference in the lives of patients, students and the communities they serve, to celebrate the 50th anniversary of the PA profession. We received over 120 nominations, and we will spotlight one of those PAs each week for 50 weeks in 2017. The first three Certified PAs have already appeared on our PAsDoThat website at http://pasdothat.net/Celebrate. Visit there to learn how Joanna Berrigan, PA-C; Scott Gordon, PA-C; and Bonnie Mueller-Waigand, PA-C are making a difference. Like and follow NCCPA, the nccPA Health Foundation, the PA History Society and other PA organizations. Then share or re-tweet good posts when you see them! Read an article that makes a positive mention of PAs? Share a link on your social media channels. Haven’t seen any of those articles lately? Check out the running list we publish at http://pasdothat.net/Read and those we highlight in each month's NCCPA News. Attending a CME event with a crowd of terrific PAs? Check in and share your excitement about the event and your commitment to lifelong learning. Learn something new? Share an insight from a CME session you attend. Finally, include #PAsDoThat in all your posts and tweets to amplify your message in the growing online dialogue about the great things PAs do each and every day. Then you can search for other posts that include the #PAsDoThat hashtag and share and retweet those, too. Check back here next month for other ways you can help spread the word. Last year, over 200 Certified PAs became the most recent additions to a growing list of PAs who have earned a Certificate of Added Qualifications (CAQs) by meeting licensure, education and experience requirements and passing a specialty exam. To see the complete list of PAs who have earned a CAQ, click here. We are working now with CAQ recipients on local press releases in their honor. Thanks to generous donations from throughout the PA profession, last month earth movers broke ground on the significant redevelopment of the Stead Center’s Veterans Memorial Garden, a site that honors the contributions made by former and current military PAs to the PA profession. 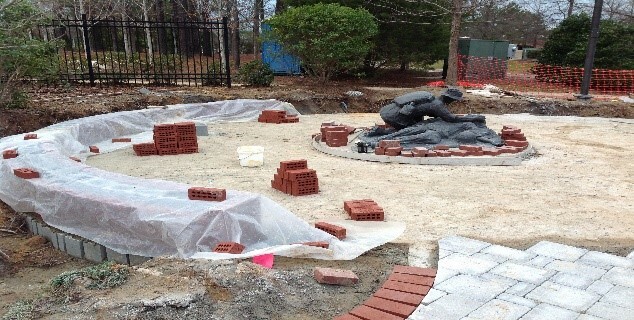 The garden will feature new brick pavers recognizing individual PA veterans and service members. 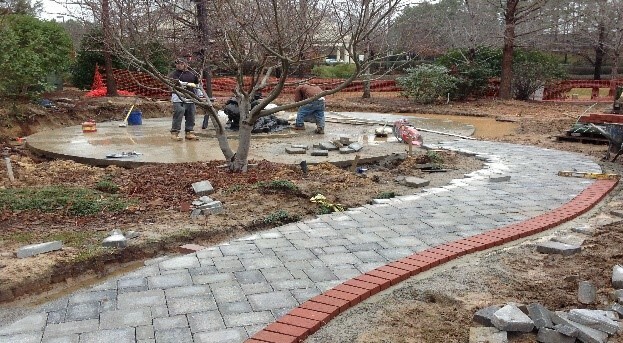 Well over 100 pavers have been purchased to date, and the garden will be able to accommodate a few hundred more. If you’re a PA veteran or service member, consider purchasing a paver for yourself or honoring a fellow PA service member this year in celebration of the PA profession’s 50th Anniversary. The tax deductible 9x9 inch brick pavers, which honor PA veterans and PAs on active duty in the Uniformed Services, can be purchased online here. The engraved paver will include the appropriate uniformed service logo and 3 lines for name, branch and years of service. Prefer to pay by check? Contact the PA History Society for instructions at ContactUs@pahx.org. Through paver purchases and donations, PAs and others have contributed $70,000 of the $72,000 needed for the garden renovation. After that initial goal is reached, any additional contributions and paver purchases will help fund ongoing maintenance of the garden. Please be sure to "like" PA History on Facebook to receive weekly updates and follow us on Twitter & LinkedIn. The Society also recently launched a Blog. Check it out! “We’re pleased to welcome our new directors, who join the Foundation as we continue our work in oral health, launch an exciting new body of work in mental health, and sustain our grants programs to support PA and student efforts to improve health,” said Ted Wendel, PhD, chair of the nccPA Health Foundation Board of Directors. The Foundation received an overwhelming response to its call for candidates, and the directors were chosen through a rigorous process that evaluated how each candidate would complement and extend the reach of the existing Board. The directors will serve for three years through December 31, 2019.